The Blue Valley Experimental Forest was established in 1964. Photo by USFS. 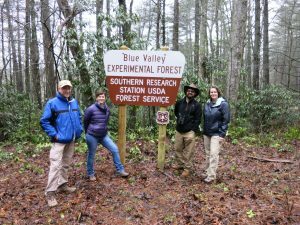 In February 2018, Southern Research Station scientists and staff participated in the second round of SRS experimental forest tours. SRS manages 19 experimental forests. Three teams visited 11 eastern experimental forests over five days. In September 2017, two teams had visited eight of the western experimental forests. Creating an experimental forest network that facilitates interactions among scientists, professional and technical support, and partners is a critical first step. 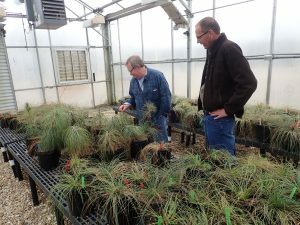 Many scientists and staff are unaware of research activities and opportunities at SRS experimental forests. Most tour participants visited forests they had never seen before and interacted with new colleagues with different experiences and expertise. Tour participants learned firsthand about the research being conducted by SRS scientists and partners. Increasing understanding of the value of SRS experimental forests was an objective for the tour. Exploring new ways to collaborate on important science questions within and across SRS experimental forests was another. The Experimental Forest Network is linking sites strategically across geographic domains and environmental gradients. Photo by USFS. One team visited Coweeta Hydrologic Laboratory and the Blue Valley, Scull Shoals, and Hitchiti Experimental Forests. A second team visited the Bent Creek, Calhoun, and Santee Experimental Forests, as well as the Savannah River Site. The third team spent time at the Harrison, Escambia, Chipola, and Olustee Experimental Forests. A network structure that engages all SRS scientists in research opportunities on experimental forests will increase the value of those forests. Broader scale questions can be addressed across multiple experimental forests. Experimental forests are a unique resource and core strength for SRS. They offer benefits to the entire research establishment in the U.S. and beyond. Despite declining budgets, the people currently working on SRS experimental forests are enthusiastic, dedicated, and engaged. Successful projects must involve collaboration with partners outside of the SRS. They must also address the needs of partners such as the Forest Service Southern Region and the Southern Group of State Foresters. Planning is underway for an experimental forest workshop. The workshop will be held May 1-3 in Little Rock, AR. This workshop will have multiple outcomes, including developing the framework to advance science across the emerging EFR network. Explore a Story Map about SRS experimental forests. For more information about the Experimental Forest Network or workshop email Stephanie Laseter at slaseter@fs.fed.us.